Everybody wants reports from their Salesforce instance. What organization doesn’t want to see pipeline health, sales team performance, customer retention rate, or marketing ROI? While Salesforce can easily produce these reports, what happens when you are hungry for more insight? What if you need to compare Salesforce customer data to your ERP’s data, trend years of historical volume, quickly filter dashboards interactively? 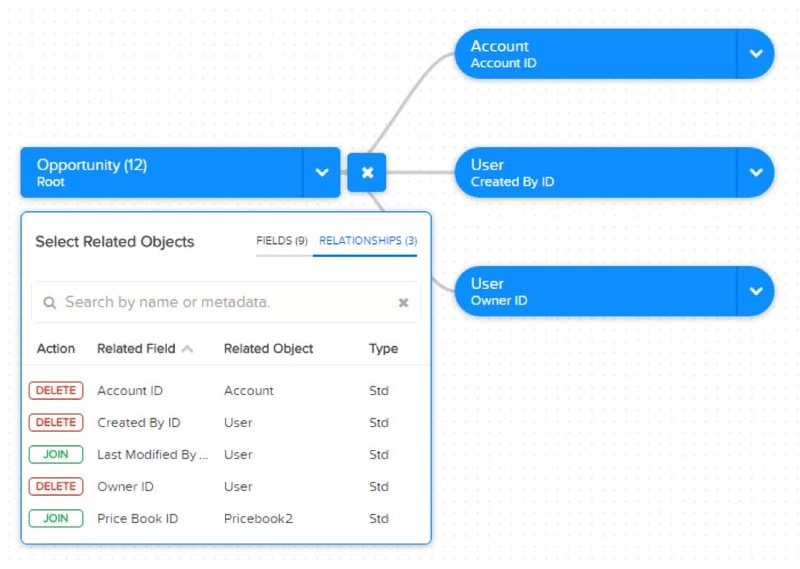 That’s where Einstein Analytics comes in – Salesforce’s own premium business intelligence tool to bridge your data with beautiful visuals and artificial intelligence. 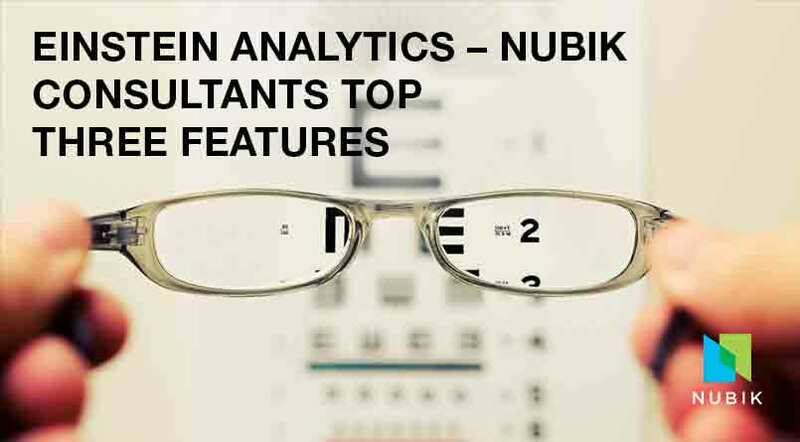 We asked our consultants to share their favorite features – let’s see the top 3 that came as most popular out of Einstein Analytics! What we admire most is the variety of visual aspects that are unique to Einstein Analytics. With so many options, we can explore the psychological and communicative aspect of analytics – what message do we want to convey, what message do viewers of the data need to see, and what type of graph will most effectively portray the reality of the data? 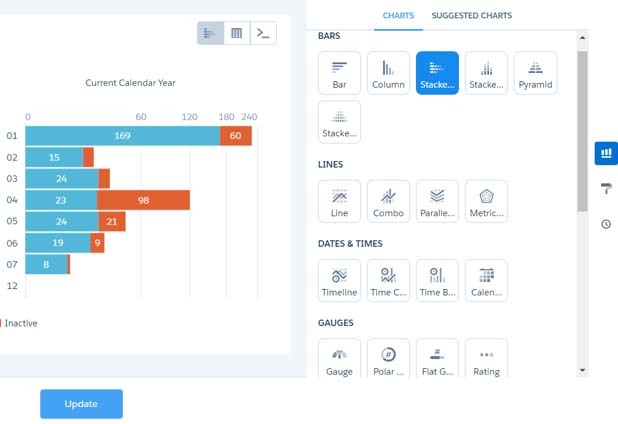 In addition to the typical bar or line or pie charts, we can choose charts that Salesforce has never seen – heat maps to see a matrix-style representation of a data range with colour representation of volume, maps to see geographical distribution of data across the globe, or sankey diagrams to see the proportionate volume of data transforms through a process. Graphs can be bound together so filtering one of them will apply a faceted search to ensure a consistent filtering of data across multiple data representations. This allows for quick maneuvering through large quantities of data spread out over many charts. Dashboards can be separated into pages and sections to group similar graphs together and can be paired with tables to show details of the records contained within the graph. Just an idea of the many available chart types! Dashboard totals on the left and details in the table at the bottom are filtered according to the selection made on the column graph. What we find really great about Einstein Analytics is it can be plug and play. There are pre-built dashboards available for Sales Cloud, Service Cloud, and Pardot. This allows any company to get great insights very quickly, without needing extensive business intelligence knowledge. There are interactive dashboards that are pre-populated with your own Sales Cloud, Service Cloud, or Pardot data, and you can embed those dashboards anywhere. You can also use those dashboards as starting points to build your own. The Sales Analytics App comes with a dashboard called Sales Analytics Home. It’s a great starting point to quickly see where you are relative to your goals. It also comes with an Executive Overview which is great for the execs to get a relevant Dashboard for them right away. The Service Analytics App comes with a dashboard called Service Analytics Overview. It gives you a quick look at important metrics. They are a great tool to get you up and running quickly, and to get your learning about the platform in an interactive way. It is always easier to learn when you have something to build from, there is no need to start from scratch with these pre-built dashboards. Einstein Analytics allows you to do complex tuning of your data the same way an ETL would do. 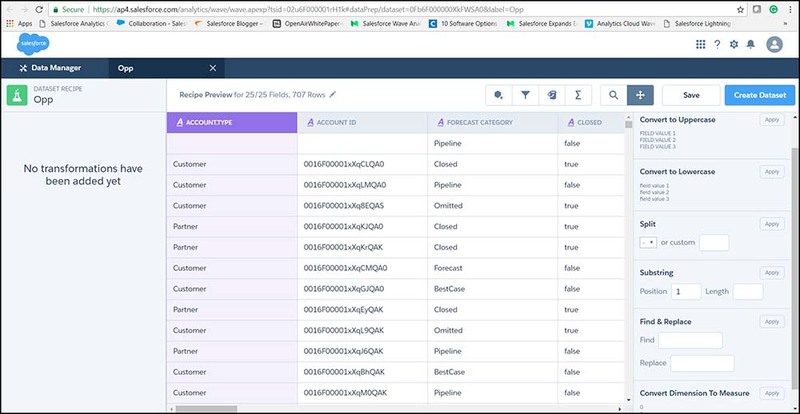 Transformations like append, augment, filter and many others are possible on any Salesforce or external data. And what we love about Einstein Analytics is that they have come up with a nice user interface to facilitate the work. You have the Dataset Builder to help you build a single dataset from one or several related Salesforce objects. And you have the Recipes which provide a nice layout to clean or combine datasets, create formula fields , filter rows or transform field values. Then the *Dataflow* will allow you to go even further like applying row-level security to restrict access to records for certain users. As a final comment, let’s just mention that artificial intelligence has simplified the analytics workflow from data preparation to context-driven visualizations and recommendations. Therefore, Einstein Analytics is seeing rapid global adoption as the only complete Salesforce analytics platform powered by artificial intelligence. You have a question? Drop us a line, we are ready to help. You found this article useful? Don’t hesitate to share!